Both on the beach and in the desert. Thus, surprising everyone who lives in the area. Turtle Skin 1.2.10 is made in impeccable quality and a way to impress even the most powerful Minecraft Pocket Edition. In addition, it reminds one of the most popular hero of the film about Ninja turtles (if it is not one of them). Want to add more adventurism and unpredictability to your game world? Then hurry up to download the Turtle skin and make it the easiest and quickest way. Without much effort. It is interesting to test this skin on new maps for Minecraft Pocket Edition. What does a turtle skin look like? This is a real turtle – green and large. The tummy is brown in color, the armor is appropriately green. 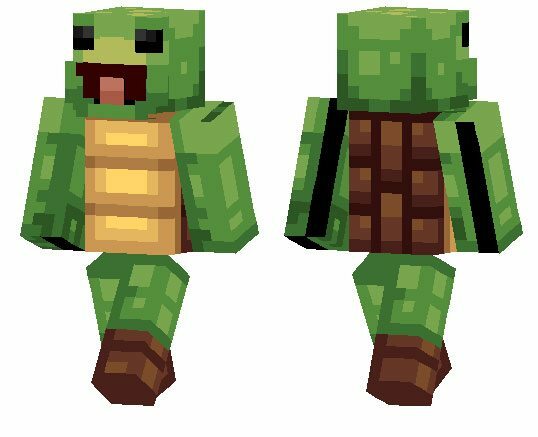 If you are tired of the same skins and want to try something new, fresh and interesting at the same time, the Turtle 1.2.10 skin is the best you can think of. The author tried to make an image of a happy turtle and he managed to do it 100%. In addition, the possibility of using 3 types of pixel weapons. Safety is paramount. When visiting new generations of worlds, be careful and find out who lives there, what their preferences are and whether sudden attacks are possible. Turtle skin is simply irreplaceable for servers – various competitions often take place there and this image will be very useful.